CBD (cannabidiol) is one of the many, many (over a hundred) active cannabinoids found in the cannabis plant. For this reason it’s often associated with THC (tetrahydrocannabinol) which is, arguably, the more famous cannabinoid. It is responsible for the euphoric feelings that are often associated with CBD in contrast though is non-psychoactive. CBD is non-psychoactive – this is the main difference between CBD and THC. Whenever someone ingests regular cannabis and experiences that ‘high’, ‘euphoric’ feeling we all know from pop culture, what they are actually experiencing is the effect of THC. CBD contains none of that. This is good news for those that want to get all the natural goodness of cannabis but without any of the fuzzy-headed side effects. THC is actually what causes cannabis to become classified a controlled substance. If you’ve not been living under a rock for the last five years you’re probably aware of vaping in one form or another. Whether it’s someone inhaling from what looks like a metal stick in the pub, or your old smoker friends discussing the best scents to vape, there’s a tonne of vaping going on. Vaping CBD in the UK has exploded in popularity. For the uninitiated vaping is the process of inhaling CBD e-liquids or concentrates. This is done using a heated atomizer and inhaling through a mouthpiece. That might sound like a jumble of words but it’s pretty straightforward. The main components of a vaporizer are a battery, atomizer, a mouthpiece, and a chamber. This last part is filled with e-juice, or can be used with concentrated forms of CBD. It’s here that your material is heated and then inhaled, as vapor, through the mouthpiece. Vaping has become one of the most popular methods of inhaling CBD because of its ease of use, discreetness, and potency. Since the technology was first introduced back in 2004 there have been huge leaps in terms of what is available to the casual vape user. This couldn’t be further exemplified than in the exploding numbers of affordable and powerful vaporizers on the market today. READ MORE: Here Is Why You Should Vape CBD Oil! Vaping is nothing if not convenient. Carrying a small vaporizer around with you is no problem at all. Some vaporizers are literally the same size as a pen and even some of the bigger handheld units can be easily stored in a bag or backpack. Plus they don’t leave behind any pungent odours that you’ll be worried about for the rest of the day. Vaping is, arguably, the fastest acting method of ingesting CBD. When you vape CBD it is absorbed through the bloodstream and then metabolized by the liver in a super quick time. While there are other options like CBD gummies or tinctures, these just can’t compare in terms of speed and potency. For those who need a CBD fix quick, then there really is no better choice than a vape. It’s not a secret that a lot of conversation surrounds CBD and cannabis. But in recent years the movement to destigmatize this potentially beneficial plant has been growing. This is in no small part because of CBD. But if you’re not particularly keen on engaging with CBD detractors while still enjoying the benefits, you’re not alone. More and more CBD products are made that focusing on providing a scent-free experience. Less scent, fewer questions. Right now there are a veritable tonne of CBD oils on the market. Vaping CBD oil has never been more affordable, convenient, and flooded with choice. In our modern age CBD oils represent a brilliant combination of nature and technology. Cannabidiol has been extracted from various hemp strains and made into a concentrate or CBD e-liquid. This ultimately means that you get the very best there is on the planet. CBD is in the vanguard of products that are not only making real contributions to people’s wellness but doing so much to destigmatize cannabis in the eyes of the public. While Canada may have become the second country to legalize cannabis nationwide last year there is still a long way to go. Improving the image of CBD so that people have greater access to its benefits is of the utmost importance. Cannabis should no longer be seen as a plant that can get you ‘high’. In fact, CBD has none of the psychotropic or hallucinogenic effects that would deem it off limits. Like everything in the world of CBD, nothing is entirely straightforward here. CBD vape oil works almost like a supplement in liquid form. It is a concentrated form of cannabidiol. Created by allowing CBD-rich hemp flowers to steep for a long time in high-proof grain alcohol. Following that, they are settled over medium-to-low heat for multiple hours which creates what we know as CBD vape oil. There are other options aside from alcohol but that is the best in the world. CBD Pen – The Future Of Consuming CBD? If you’re interested in vaping CBD then a CBD pen is an absolute must. You can’t really go wrong with a CBD pen because they are affordable, convenient, and above all, discreet. Plenty of online retailers and stores now stock them as they know the demand is high. If you’re new to the world of vaping and are feeling a bit unsure, a CBD pen is an absolute must try. Although subtle, the potency will astound you once you get rolling. What is a CBD vape pen? Well, to sum up, a vaporizer pen or vape pen is a small device somewhere between the size of a pretty big cigarette and an actual pen, that you can use to vaporize CBD. CBD vape pens are super handy to carry about with you, you can pop them in your bag or purse and be all set to go in no time. Added to that they are incredibly discreet. E-cigs and vapes are a common sight these days, and a CBD vape pen is unlikely to draw any prolonged attention. Of course, the laws around CBD seem to be changing all the time. Look around the internet for the latest news and things aren’t always so clear. But if you start searching for CBD vape oil UK, however, the results may surprise you. In the United Kingdom, the government has classified CBD into a non-harmful substance. For the customer, this means you are seeing a rise in availability and presence of CBD. Everywhere you go now it seems like someone is talking about CBD and all over the country small retailers are setting up shop. The trend of CBD vape oil UK is only just starting. 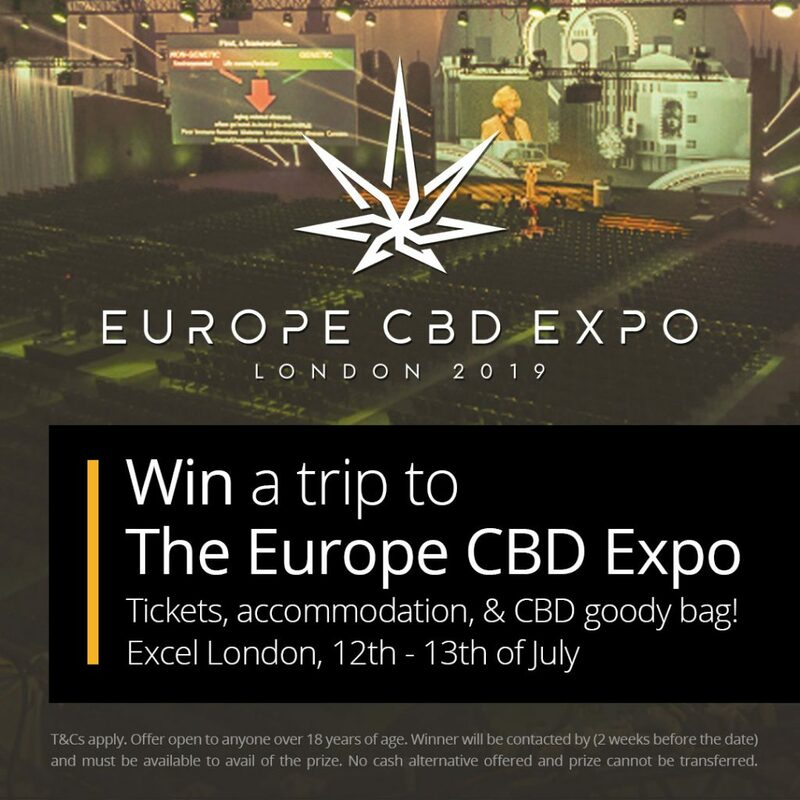 Win tickets to the biggest CBD event of the year! CBD & Social Media Influencers – The Perfect Match?